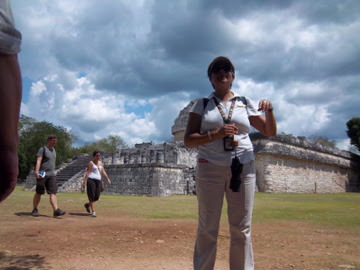 with the bold text in the example below: The Skychi Travel Guide : Will the gods shine at Chichen Itzas Spring Solstice? Will the gods shine at Chichen Itzas Spring Solstice? This has been an unusual vacation for me. I am accustomed to planning my own itinerary. 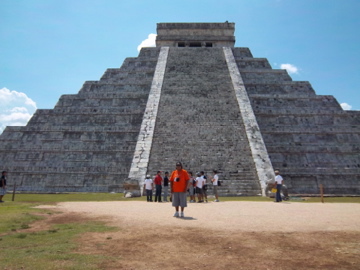 Today, I went on a full-day group tour to Chichen Itza, one of the Seven Wonders of the World. It was a completely different experience for me. I had no clue of what to expect for the day, as I had not bothered to ask about the itinerary. So everything was a surprise to me. The bus ride was two hours from Cancun to Chichen Itza. We left the Sun Moon Palace Resort about 8 am and arrived in Chichen Itza about 11 a.m. because of one rest stop along the way. There were three motorcoach tour buses from the resort with about 50 people each for about 150 people. Once at Chichen Itza some people went off to explore on their own and others followed the tour guide. I decided to stick with the tour guide so I could enjoy the history of tour. It seems that is is winter in Mexico but it is still 90 degrees. There are no mosquitos because it is winter. During the tour it started raining. I wondered why there were people carrying umbrellas. At first I thought it was for protection from the sun. Now I understand one should be prepared in case of rain too. Big tip it is spring so, carry an umbrella. It will protect you from the sun or possible rain. On March 21st is the Sun Solstice, thousands of people will gather at Chichen Itza to watch the sun pass from the front door to the back door of the Observatory. At the same time the sun will also pass through door of the main monument. The sunworshippers will wait for the snake tail to zig zag its way down to the snake head. That is if the gods are happy the sun will shine. If a cloud passes over or it rains then the Mayans believed that the gods had to be appeased with the blood of human sacrifices. It seems that men were the preferred to be sacrificed over women. Evidently, the gods were not happy the day of our tour because we had a downpour that started at noon and lasted the rest of the day. Happily there were no sacrifices to appease the angry gods. to meet the snake head? How to speed through Customs & Immigrations?